This year’s World Nuclear Status Report was published in July. 2015 turns out to have been the best year for new nuclear builds in a quarter of a century, but nothing at all has been completed yet in 2016. Craig Morris takes a look. The report (available here as a PDF) reveals that 10 nuclear reactors were completed last year, the highest number since 1990. China alone accounts for eight of them. As the study’s chief author Mycle Schneider states in this radio interview (in German), the nuclear sector basically consists of China and the rest of the world; only the Chinese are pursuing nuclear to a significant extent. Of the eight new reactor projects that started in 2015, six of them were in China. Only two reactors were shut down last year (one of them in Germany), bringing the total number of reactors in service to 402. 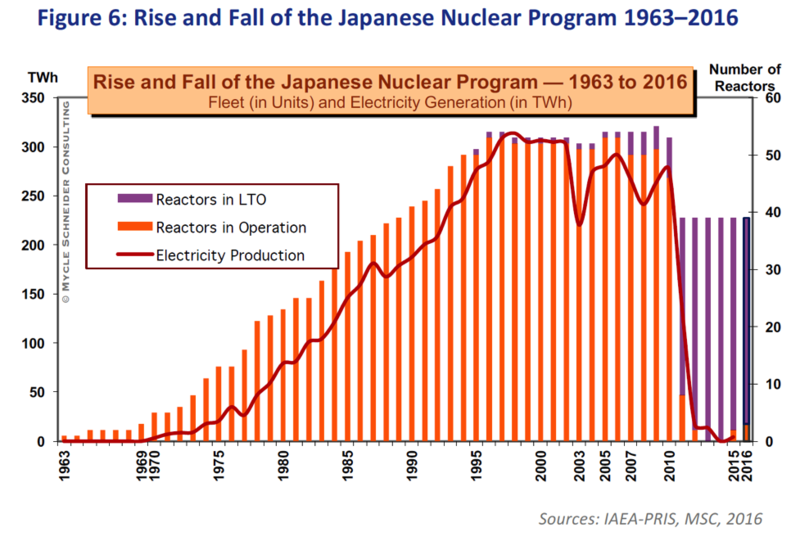 The status of many of the Japan’s reactors is still up in the air. The country only had two reactors online in 2015. But the number of reactors in the pipeline is down overall. In 2013, 67 projects were underway compared to 58 today. That list includes six projects that have been ongoing for at least a decade, and three that have been listed as under construction for more than 30 years. And no new projects started in the first half of 2016—the first time that has happened since 1995. As Swedish energy expert Tomas Kåberger explains in the report’s forward, nuclear power production increased by 31 TWh, far below the increase of more than 250 TWh in renewable power generation. Indeed, wind power production alone continues to outstrip the growth of nuclear power in China (a fact that isn’t in the report, but we know it from my colleague Bernard Chabot). Nonetheless, China alone accounts for the increase in global nuclear power production with an increase of 37 TWh. In the pledges made at COP21 in Paris last December, only six countries stated that they wish to expand nuclear, compared to 144 countries that pledged more renewables. As global power demand increases, the share of nuclear has fallen from 17.6 percent in 1996 to around 10.7 percent over the past four years. As a share of total primary energy consumption, nuclear remains marginal at 4.4 percent (lower than the share of traditional biomass alone at 9 percent). France is the nuclear leader, with roughly 75 percent nuclear power in its supply (no one else has above 50 percent). Yet, France is not a major supplier of new nuclear reactors to the world; the study speaks of a “dominance of Russian technology” in proposed projects. The world now has 59 reactors more than 40 years old, 37 of which are in the United States. Of the 100 existing US reactors, 81 now have 60-year commissions. No reactor has ever been in service for more than 47 years, the age of three reactors at present. 2016 was also the 30th anniversary of the accident at Chernobyl and the fifth anniversary of the accident in Fukushima. The number of deaths directly attributable to radiation in Chernobyl is highly contested, but the study takes a different angle, pointing out that an estimated 40,000 people are expected to die in the next 50 years due to the fallout in the area—a clear indication that we cannot discontinue the count. Likewise, the human toll in will continue to unfold in the next decades in Fukushima. For now, just the cost of damage in dollars is unclear, with one estimate coming in at USD 133 billion. Those are just some of the highlights. The study can also be used as a reference work; it covers individual countries with nuclear power or plans in some detail. In fact, it covers numerous individual reactors in detail. And in passing, you learn things like which country is the world’s largest uranium supplier (Kazakhstan at 40 percent of the global market). The amazing thing is that all of this information comes not from the nuclear industry itself, but from its independent watchdogs. Is there any other sector that still refuses to report its own data long after critical onlookers have established such an exhaustive overview? Well, the arms industry? Drugs?